” The ABG should be receiving SEVENTY MILLION KINA annually under the Restoration Development Grants of which it has accumulated to nearly ONE BILLION KINA. This year the National Government budgeted for FIFTEEN MILLION KINA to ABG but until today the ABG has not seen ONE TOEA of those RDG funds. I realise that the National Government has its own budget crisis. But the lack of funds being received by the ABG is leading to a desperate situation for us. (e) Call for the first meeting of the full BRC to be held as soon as practicable. pending the BRC trust account becoming operational. become operational as soon as is practicable. continued support of the respective governments to the BRC. The JSB resolved that the Joint Technical Team study and evaluate the proposed new awareness messages prepared by the ABG on pre-referendum and post-referendum issues, and authorizes the two Chief Secretaries to process and approve such messages on a progressive basis. (a) That after receipt of joint legal advice on issues of constitutional compliance of different options for the question or questions to be put in the referendum, that a special JSB be called before the end of July to consider what question or questions should be put, including the use of symbols. (b) That, once the question has been endorsed by the JSB, that the BRC be tasked with undertaking testing and outreach work to ensure that the question is clearly understood, and that all eligible voters understand what each option means, including potential implications arising from either option. This should include development of a ballot design and appropriate wording in TokPisin. and associated legal matters to give effect to the operational conduct of the referendum. 2. The JSB further resolved that following further joint legal advice on constitutional compliance, that the BRC should be responsible for putting in place the necessary mechanism to give effect to the above arrangements. 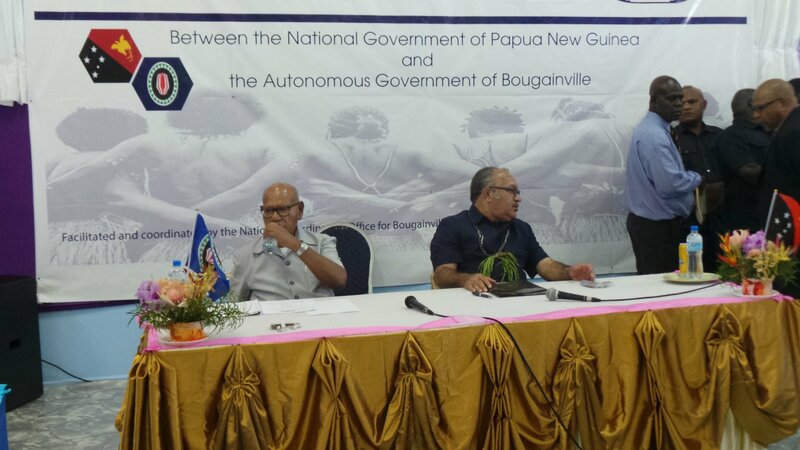 iv) Developing an agreed basis for the ongoing relationship between Bougainville and PNG. Draft terms of reference are attached. 3. To agree on the holding of a Joint Post Referendum Summit and directed officials to immediately prepare the necessary documents for the conduct of the summit in late 2018 in Buka. 1. To accept the progress report on the implementation of the Four Phase Weapons Disposal Plan. 2. That agreed national government funding support of K12 million over three years be affirmed, with a commitment that K7million in funds be provided in the 2018 financial year, subject to savings in the 2018 National Budget. 3. 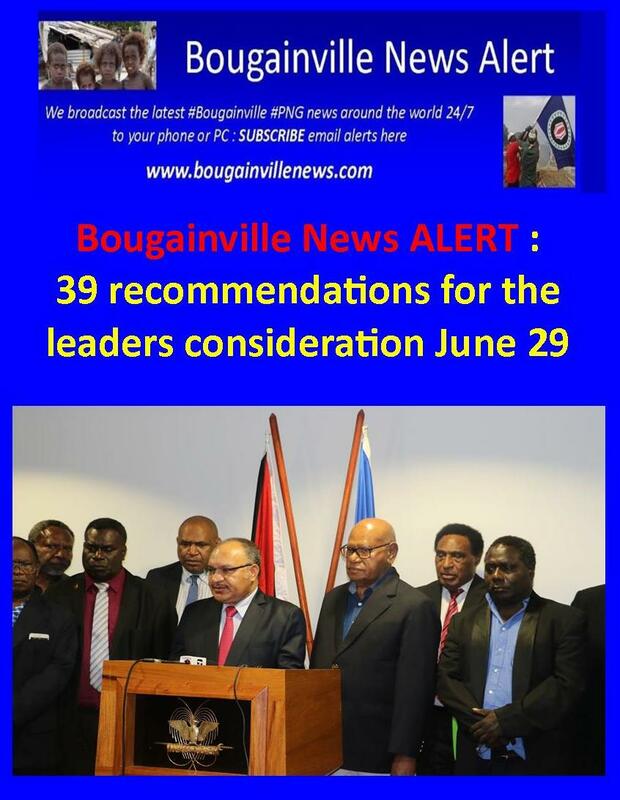 That the link between weapons disposal and a free and fair referendum be affirmed, noting that continued work to remove the scourge of weapons from Bougainville remains a joint National Government and ABG responsibility. 4. To note and endorse the proposed plan for the disposal of explosive ammunition and weapons and noted that that the two Chief Secretaries have jointly written to the Governments of the United States, Japan and Australia to seek funding and capacity building support to enable disposal of World War II remnants. e. The PNG Firearms Act. 1. That the UN offer of technical and financial assistance for the conduct of the Review be noted and accepted. 2. That the experts proposed by the UN to conduct the review have been endorsed by the co-chairs of the JTT. 3. That Leaders note that the Review is expected to be finalised by the end of October 2018. (a) That work on the drawdown of powers should continue, noting the very limited progress to date, recognising that there is a need for enhanced agency engagement. (b) That a meeting of the Joint Technical Working Group (JTWG) on the Drawdown of Powers convene without delay to consider a revised workplan for progressing the drawdown of powers, noting that priority should be given to those powers that provide maximum economic benefit. g. To note the need for the establishment of the Bougainville Fisheries Management Authority (BFMA). (a) That Leaders re-affirm the compromise agreement on Restoration and Development Grant arrears reached at the Joint Supervisory Body Meeting of 15 December 2017. (b) That Leaders agree that the arrears to be paid of K437 million are over and above any 2018 and future year budget allocations. (c) That the two governments agree that the two Chief Secretaries will meet again to examine means through which disbursement of funds can be made. (d) That the ABG will prepare an expenditure plan for the K35 million to be financed by the National Government in 2018. (e) That further discussion on the formula to apply in relation to the RDG in future years take place before JSB, with a view to determining the formula and amount to apply in future years. (f) That the governments shall jointly appoint a finance expert to advise on the correct approach to calculation of the RDG going forward, and if the governments are unable to agree on the advice provided, then a joint reference should be made to the Supreme Court seeking a binding ruling on how the RDG should be calculated in future years. (a) Acknowledge the progress made on the ground in Bougainville, on high profile cases and through joint PNG National and Bougainville Women’s organisations as well as former combatant groups. (b) Acknowledge the progress and success in relation to the endorsed program of work. (c) Note the challenges involved in the tasks of peacebuilding in Bougainville. (d) Note the need for another program of work in relation to National and International Reconciliation. (e) Acknowledge the need for joint funding support for ongoing peacebuilding efforts. The JSB resolved that the two Chief Secretaries will meet and discuss the legal status of the 17.4% of shares to be transferred to Landowners in the near future. The JSB resolved that the Department of Prime Minister and NEC prepared a submission to Cabinet without delay, to enable national government representation of the BSAC to be formalised without delay. • Formally endorse Mr Bertie Ahern, international peace-builder and former President of Ireland, as Chair of the Bougainville Referendum Commission (BRC) and invite him to attend the meeting of the JSB in Arawa from 28 to 29 June 2018. • That ABG Members of the BRC, Mr Patrick Nisira and Ms Ruby Mirinka be noted and the National Government Members of the BRC be finalised before the meeting of the JSB. • Establishment of funding of K20 million be transferred to a formally endorsed BRC trust account. • Officials meet to review legal arrangements related to the Organic Law and the need for possible amendments, including constitutional regulations and associated legal matters to give effect to the operational conduct of the referendum. • That the ABG will prepare an expenditure plan for the K135 million to be financed by the National Government in 2018. • Endorse arrangement for the Second Autonomy review, which is expected to be finalised by the end of October 2018. • Endorsement of the progress of the Four Phase Weapons Disposal Plan and funding support of K12 million over three years be affirmed, with a commitment that K7million in funds be provided in the 2018 financial year. 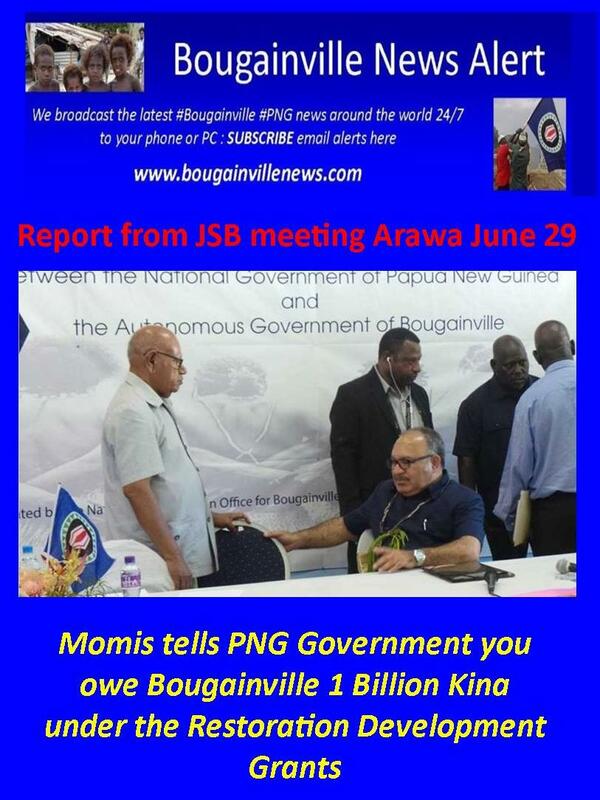 Mr Momis stressed that Bougainville is not receiving the amount of recurrent grant needed to meet salary costs, and not enough for our Public Service to do much at all. President Momis said that he hoped that we will reach agreement here on what RDG payments should be going forward and that in 2019 we will see payment at the correct level, of more than SEVENTY MILLION KINA. Meanwhile, Prime Minister in his response said that a Trust account for the BRC has been created and funds promised will be deposited soon. He said that the National Government is committed to jointly implementing the Peace Agreement with the Autonomous Bougainville Government. He also said that he had brought FIVE MILLION KINA with him today for the RDG from the budget of FIFITEEN MILLION KINA for this year, with an outstanding of TEN MILLION KINA still to be paid. The Joint Supervisory Body meeting held this afternoon agreed to defer the Questions to be put on the Referendum vote next year to its end of July meeting in Port Moresby. According to the resolution by today’s JSB meeting is that after receipt of joint legal advice on issues of constitutional compliance of different options for the question or questions to be put in the referendum a special JSB has been called before the end of July to consider what question or questions should be put including the use of symbols. The meeting also resolved that once the question has been endorsed by the JSB the BRC will be tasked with undertaking testing and outreach work to ensure that the question is clearly understood, and that all eligible voters understand what each option means, including potential implications arising from either option. This will also include development of a ballot design and appropriate wording in Tok Pisin.